Art-tainment resort Paradise City opened Paradise Art Space, an onsite, purpose-built exhibition space for modern and contemporary art on September 17, 2018. Paradise Art Space will be home to Paradise Group's significant art collection, as well as supporting new contemporary art via special exhibitions. Paradise Art Space unveiled its inaugural exhibition "Overstated & Understated" to commemorate its opening. This exhibition, curated by Jung Kuho, juxtaposes the work of four internationally-renowned contemporary and offers a glimpse into contemporary art today. 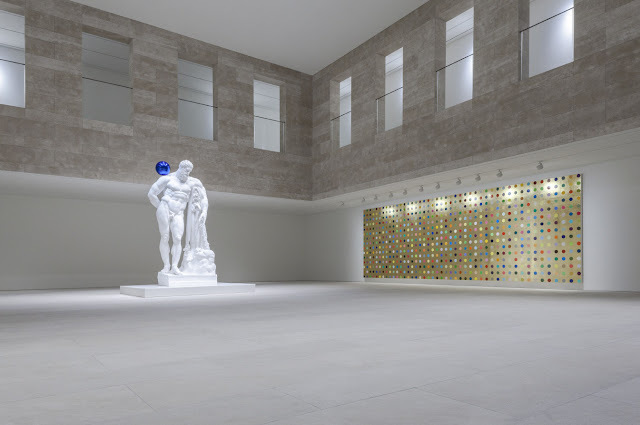 At the entrance of Paradise Art Space is a permanent exhibition hall, where "Gazing Ball-Farnese Hercules" by Jeff Koonsand "Aurous Cyanide" by Damien Hirst were unveiled. These works by the two giants of contemporary art are owned by Paradise City and form part of the space's permanent collection. As part of the artist's Gazing Ball series, Jeff Koons' Hercules dominates the entrance hall providing visitors with their first encounter with Paradise Art Space. Depicting Greek Mythology's ultimate hero and tellingly constructed in delicate white plaster, the sculpture sees a delicate blue bauble perched atop Hercules' right shoulder, allowing interaction with visitors whose reflections are caught in the blue sphere. Covering the entirety of one wall is Damien Hirst's "Aurous Cyanide", a unique piece acquired by Paradise City as part of its permanent collection. Being one of the most famous pieces of his Spot Painting series, "Aurous Cyanide" is the world's largest single canvas painting at 9 by 3 metres and plays on the themes of life and death in a range of bright colours, with a title that directly infers chemical toxicity. Special exhibition halls on the first and second floor respectively exhibit massive installations by two Korean artists that consider the beauty of the colour -- black. The viewers can encounter the overwhelming power generated by traditional materials of charcoal and ink in the works presented in the form of contemporary art. The ground-level hall showcases "Issu du feu", a work by Korean artist Lee Bae which brings together hundreds of charcoal pieces on Korean hanji paper. A combination of rough texture of charcoal and hanji paper smoothly absorbing various angles of lights offers visual delight to the viewers. Upstairs on the second floor, "All of Sudden, Drawing the Space", an installation by Kim Hodeuk awaits visitors. The hanji papers on the wind and smoothly waving inky water are placed harmoniously, creating a tranquil rhythm. As its title suggests, the shadow cast by the installation on surrounding white walls purposefully forms part of the work. When the viewer's eyes turn away from the work, they are invited to another world "drawn in the space". The unveiling ceremony in the morning of September 17, 2018 in celebration of the opening was attended by Paradise Group Chairman Phillip Chun, Director of Paradise Culture Foundation Elizabeth Chun, and artist Jeff Koons. Various performances were held at a gala dinner on the same day, including overture to the Korean Royal Ancestral Shrine Music, one of the themes in "Feast" directed by Jung Kuho, which created a sensation with its interpretation of Korean traditional dance. Meanwhile, a Montblanc pen exhibition will also be held from September 19 to 30 to congratulate director Elizabeth Chun on winning the Montblanc de la Culture Arts Patronage Award. Paradise Group Chairman Phillip Chun said, "Paradise Art Space is a hub of new Asian modern and contemporary art where Korean and global cultures are brought together, and will show contemporary art transcending national boundaries by exhibiting works of renowned artists from Korea and abroad and by offering the visitors with an opportunity of hands-on experience. Paradise City also hosts the Paradise City Festival on September 21 in time for the opening of luxury boutique hotel Art Paradiso, spa Cimer, and the largest club in Northeast Asia Chroma. The festival will be an opportunity to enjoy all the charms of Paradise City. Various parties based on different themes of the new facilities with enhanced entertainment elements will offer a fascinating experience to the guests and visitors.